This page is be dedicated to analysis of the extent and cause of the injuries suffered by Lord Darth Vader. In Return of the Jedi Obi-Wan Kenobi states that Vader is "more machine now than man." 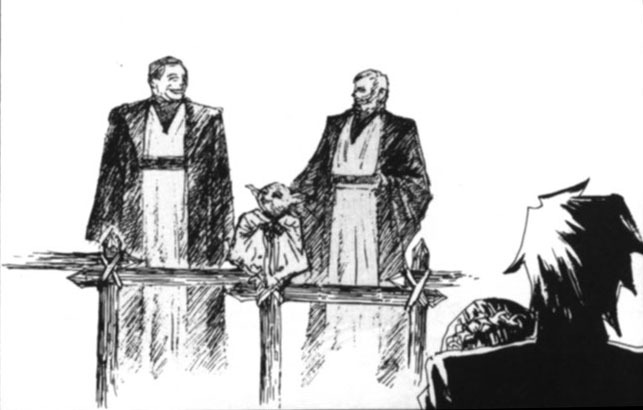 This page will be concerned with investigating the extent Kenobi's statement might be literally true and the extent to which it is merely "a certain point of view." Little is known about the origin of Lord Vader's infirmities. What seems certain is that they result from grave injuries suffered during his career as Jedi Knight and Sith Lord, between the Battles of Geonosis and Yavin. The damage was inflicted in at least two separate incidents, beginning with the loss of 3/4 of his right arm in combat with Count Dooku. According to chronological information given by George Lucas in official interviews, Vader was only aged in his mid forties when he died aboard the Death Star II; his disabilities are not the infirmities of old age. "I remember very early on asking who my parents were and being told that my father and Obi Wan met Vader on the edge of a volcano and they had a duel. 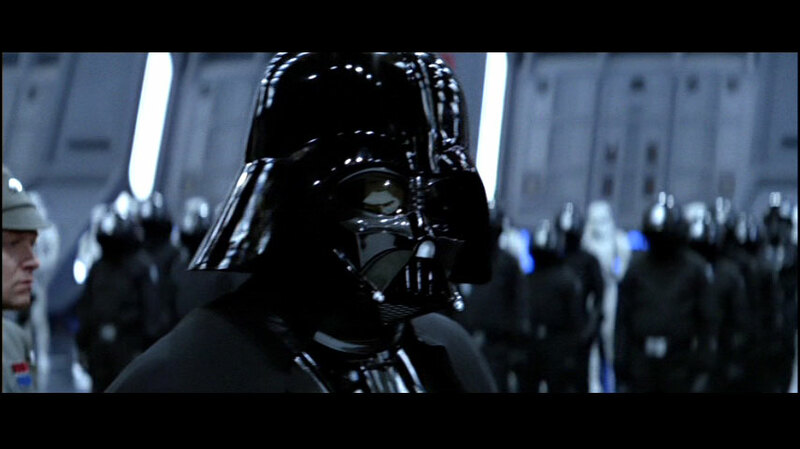 My father and Darth Vader fell into the crater and my father was instantly killed. Vader crawled out horribly scarred, and at that point the Emperor landed and Obi Wan ran into the forest, never to be seen again." This quote is not canonical, but it probably includes some elements of what Lucas considered to be the genuine history in the 1970s. In the more recent STAR WARS: The Annotated Screenplays , Lucas reveals that he did hold a lava theory "at one point". The story may have changed since then, or Hamill may not have been fully informed. At least one major fact has changed: Anakin Skywalker and Darth Vader are now identified as the same man. (The second draft of The Empire Strikes Back screenplay tells an alternative story, indicating that Vader fell into a nuclear reactor shaft rather than lava. In this case, his infirmities may have something to do with mutation, radiation sickness and extensive cancer.) 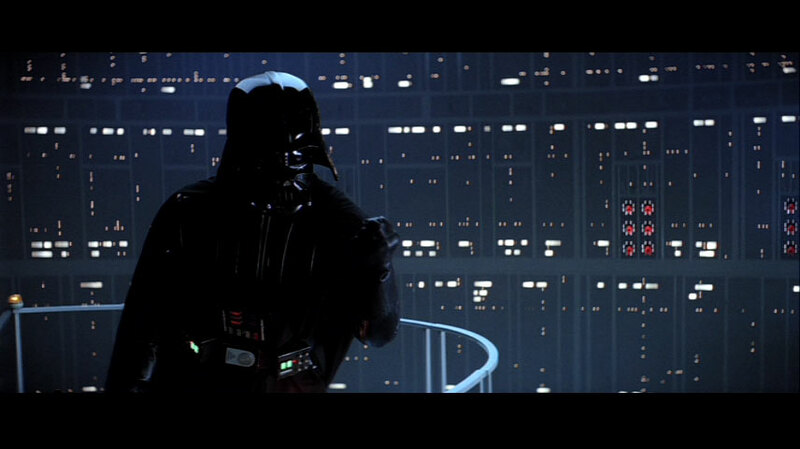 The Emperor's supposed involvement is interesting, as is the implication that Vader escaped under his own strength.
" We fought ... your father fell into a molten pit. When your father clawed his way out of that fiery pool, the change had been burned into him forever — he was Darth Vader, without a trace of Anakin Skywalker. Irredeemably dark. Scarred. Kept alive only by machinery and his own black will ... "
These were memories he wanted none of, not now. Memories of molten lava, crawling up his back ... no. This boy had pulled him from that pit — here, now, with this act. This boy was good. These quotations are evocative but they aren't absolutely clear. For all his amiability, very little of what Kenobi says can be taken literally; his treatment of truth is loose, often self-serving and deceptively figurative. Even the latter passage, taken directly from Vader's thoughts, is rich on symbolism but poor on substance and detail. The true events surrounding the infliction of Vader's injuries had additional twists, complexities and implications. This explains most (but not all) of Lord Vader's injuries. Vader may have experienced mishaps between the films. He may have lost more flesh from his limbs before his final fight at Endor. His spinal damage may have resulted from an accidental fall into a pit on Mimban [in Splinter of the Mind's Eye , though the book doesn't show how badly he was hurt]. Lord Vader could have suffered extra injuries during his hunts for surviving Jedi and the Clone Wars campaigns that continued after the Empire was proclaimed. Nonetheless, if the passages from Return of the Jedi are taken literally, the worst of Vader's injuries result from serious burns inflicted when he fell in a volcanic environment (and not a reactor, nor molten metal or carbonite). The fact that he was able to "claw" his way out indicates that he was left with at least one marginally-functional arm. 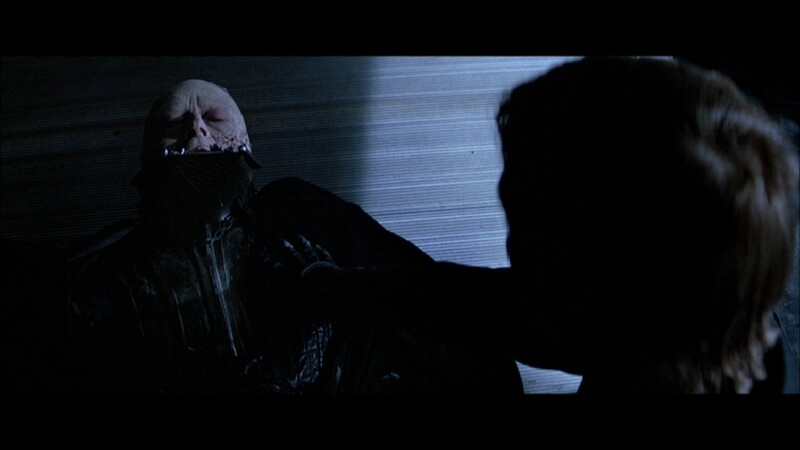 This may be inconsistent with the paralysis which must result from Vader's spinal injury [see skeleton], though for a man so strong in the Force, the exertion of raw willpower might temporarily overcome the physical handicap. In any case, we have no sure proof that the spinal damage coincided with the other injuries. Vader's imagination of lava "crawling up his back" suggests that he fell with his head upwards, and hints that the lower parts of his body might have been more extensively affected. The Revenge of the Sith comic affirms this. 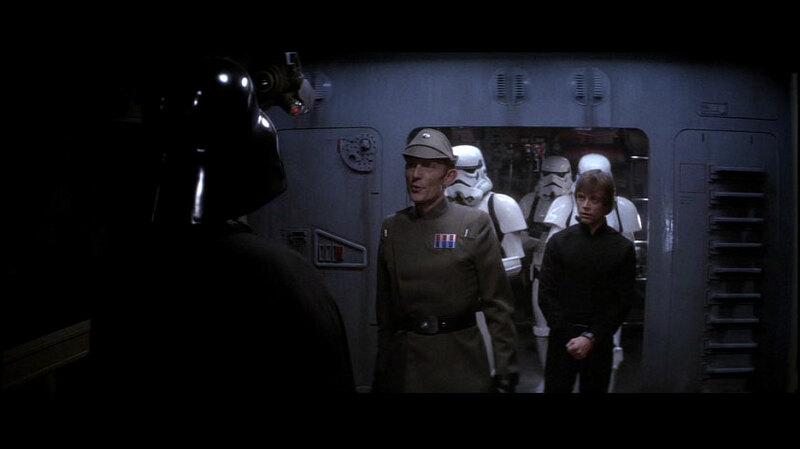 According to Lucas in STAR WARS: The Annotated Screenplays , Vader is a "three-quarter mechanical man and one-quarter human", but he has not revealed how these proportions are distributed. The division may be sharp and stark, or the cybernetics might intertwine and insinuate throughout the remaining living tissues. The remainder of this web page will examine the specific, observable evidence regarding Lord Vader's lasting infirmities during his quest for his long-lost son, the four years leading up to his redemption and heroic death. The clearest evidence for the final extent of Lord Vader's cybernetic limbs and organs was seen when he seized Emperor Palpatine and hurled the tyrant to his doom. 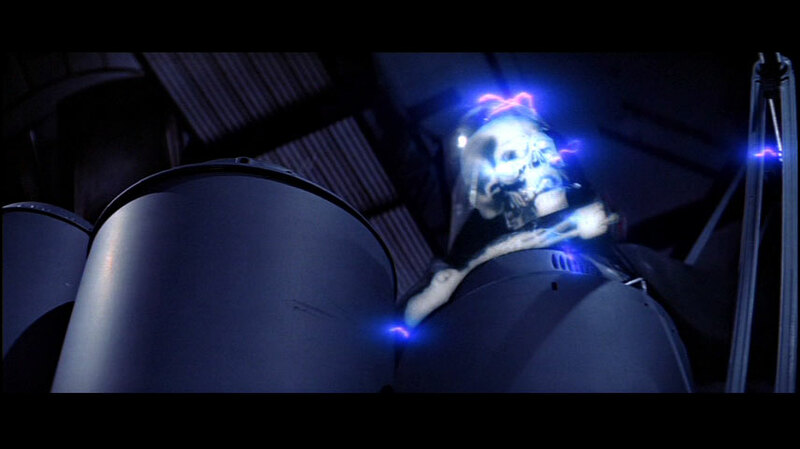 The lethal Force lightning which had been intended for Luke Skywalker arcs over to strike Vader, causing at least some parts of his skeleton to glow brightly through his body and armour. It can be surmised that much of the original flesh remains in those parts of the body where an original human skeleton is seen. Here Vader grabs and lifts the Emperor. At this point we have a good view of the side of Vader's body. The original bones are present in his upper torso, neck and head. 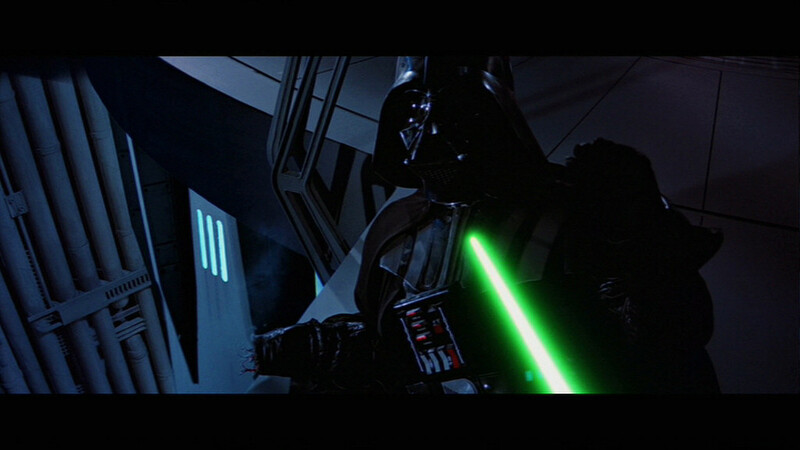 Note that Vader is lifting Palpatine with his left arm, which does not show any bones in this picture even though it is the closest arm to the camera point-of-view. Of course the absence of bone glow in this particular picture does not prove that the bone is not there. It is possible that the lightning has not struck the arm with sufficient strength. In later moments, the left arm emits a distinct skeletal flash. The above two images show some intriguing structures in the left arm. There is a clearly artificial group of structures at the shoulder joint. The main joint attaching to the torso is regularly circular, with a pneumatic mechanism attached for articulation or support. 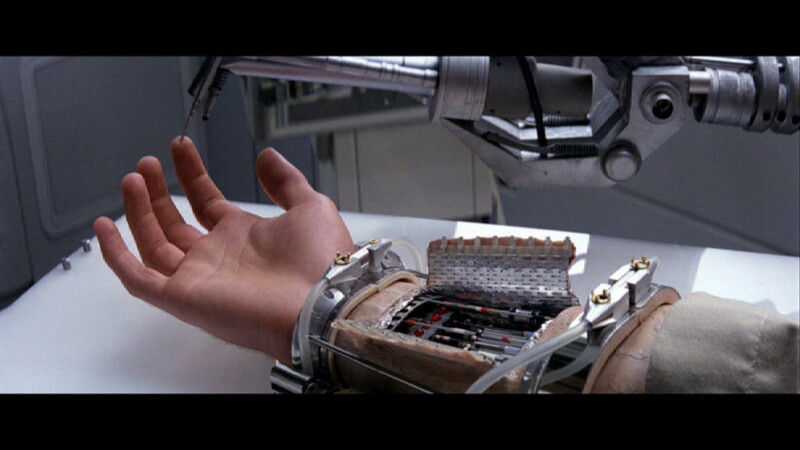 Therefore Vader's left arm almost certainly consists either substantially or entirely of cybernetic replacements. A close view of Vader's skull and neck flashing through the helmet and shoulder armour. Structures within the helmet can be seen superimposed with the bones. This shot reveals that Vader's skull is at least basically complete. The cranium is excessively rounded for that of an adult human, suggesting deformation. Although natural, the jaw bone is large, meaning that prior to his injuries Vader's chin might have been a prominent facial feature. Vader has suffered serious spinal injury in the upper neck (possibly inflicted in the same incident as the possible head injuries). The first few vertebrae are not natural. Their sharp-edged regularity suggests that they are cybernetic replacements. The fact that the lightning arcs around Vader's head to preferentially enter his body in the upper neck might mean that the vertebrae are composed of a material different from the rest of his skeleton. (Although bone replacements would probably be designed with close to natural physical characteristics, the electrical characteristics might differ.) A break in any of the first three vertebrae leads to complete paralysis from neck to toe. This could explain his immobility after the Emperor's lightning attack damaged his cybernetic systems: without his spinal bionics, Lord Vader becomes a helpless quadraplegic. The late actor Christopher Reeve lived in a similar condition. 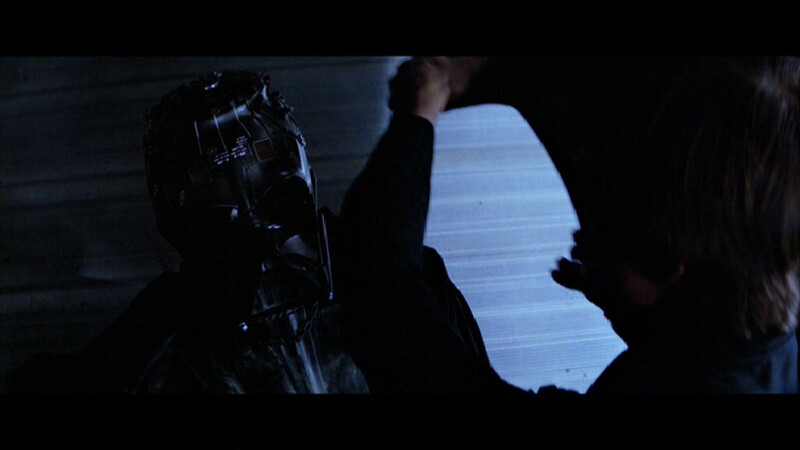 Unlike Reeve, Vader's neck is not fused into place; full neck movement is a benefit of the complete replacement of his original damaged bone. Vader's spinal injury also leaves him unable to breathe unaided. It severs the connection between the lungs and the medula oblongata (the part of the brain which controls the muscular movements for breathing). A person requires a respirator if the spinal cord is severed at any of the first three cervical vertebrae. At the fourth vertebra (C-4), a respirator would be beneficial. [In the above picture], it is apparent that [the] C-2 ... vertebral body is an implant. If you look farther down C-3 and C-4, I believe are also implants. At C-2, he may not have suffered spinal cord injury, but did at C-3. The vertebral body (the actual bone) may have just been crushed at C-2 and maybe 1, but no neurological damage. He must have suffered some at C-3 however. This is supported by the fact that Vader could breathe shallowly and talk in a low and laboured voice with his mask off ... in Return of the Jedi . If he had injury at C-1 or 2, he might have been unable to speak that clearly for that long. This is because the nerves that innervate the diaphragm leave the spinal cord at these levels and below. It comes from several levels, beginning at C-1 (nerve) and going down to C-4 (some sources say even C-5). The farther up the spinal cord you go, the less function there is available. Once neurons in the CNS are severed, they never grow back by natural means. Vader must have had some circuits that bypassed the damage in his spinal cord, because ... he was very agile. ... If not, he would be bed-ridden. At C-3 spinal nerve (the last level intact after a complete lesion of C-3 vertebrae) the maximum functional capacity the patient would have would be talking, chewing, sipping, and blowing. Respirator is required, with a full-time attendant for the patient. The patient may obtain locomotion with an electric wheelchair that has chin controls or other modifications. This is the level I estimate Vader's injury occurred. A C-4 complete lesion would leave C-4 spinal nerve the lowest available for muscle innervation. A patient with this level of injury may be able to perform a limited "shoulder shrug." The individual may be able to paint or write using his or her mouth. This patient would be completely bed-ridden, and would be completely dependent on someone else to move in the bed (rolling from one side to the other, etc). This is considered the lowest level Vader's injury took place since he required a respirator. It is possible that he sustained damage to lower levels as well, but any lower injuries would produce no neurological deficits (assuming the Cervical lesion was complete) because the neurons would already be severed. So the state of Lord Vader's spinal injuries is: bone was broken at the second and third vertebra, and possibly the first, and fourth too. The spinal cord itself is not broken until the third or fourth vertebra. (The severance must be nearly but not totally complete, because he retains the ability to breathe weakly for at least a few seconds unaided.) There could be other breaks lower on the spine, but they wouldn't make his condition much worse than it already is. 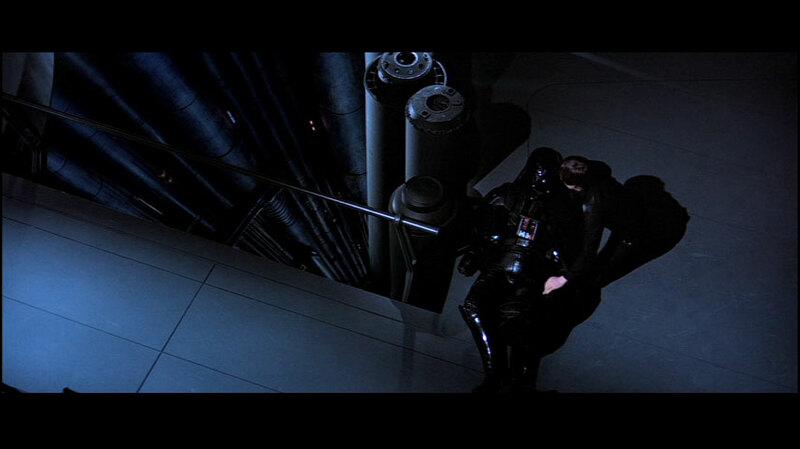 Vader stumbles at the edge of the air-shaft after hurling the Emperor to death. His skull is brightly lit, and his lower jaw is somewhat slack (which is not surprising given the amount of pain that he must be experiencing). The collar-bones are fixed to an obviously-artificial support structure rather than the usual sternum. Four thin curved features which may be cybernetic signal or power cables, or perhaps additional neck supports, link from the neck vertebrae to his shoulders or upper back. 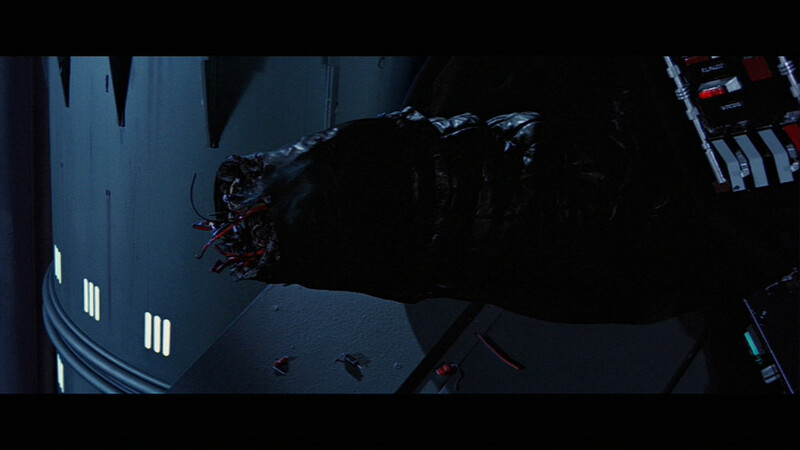 A thick cable enters Vader's torso from near the cybernetic control-box chestplate. It connects to a large internal feature which is too low to be the lungs or heart but which might be associated with the liver. Alternatively, it could be an internal device for regulating lung and heart functions, but set in a lower position for the sake of a design convenience. The lower right arm contains artificial structures, without excluding the possibility of natural bone in the upper arm. We already know that his right hand and wrist are cybernetic, since artificial mechanisms were revealed at the stump where Luke's lightsabre cut off the hand. Furthermore, we saw Anakin lose the lower three quarters of his arm in a duel with Count Dooku 26 years previously [ Attack of the Clones ]. The right shoulder is original flesh, as argued below. In summary, Vader still has original human skeleton in his upper torso, neck, head and possibly a stump of his upper right arm. These sections of his body are probably wholly or substantially original flesh. Several of the neck vertebrae seem to have been replaced in order to restore bodily control after a serious spinal injury. Without his cybernetic parts, Lord Vader reverts to being a quadraplegic. The skeletal flashes yield no evidence regarding Vader's legs. The Emperor's lightning failed to illuminate any human skeleton in the Dark Lord's lower left arm, but that arm obviously does contain prosthetic mechanisms at the shoulder. It remains to be shown canonically how much of Lord Vader's legs, lower left arm and upper right arm were artificial on the day he died. 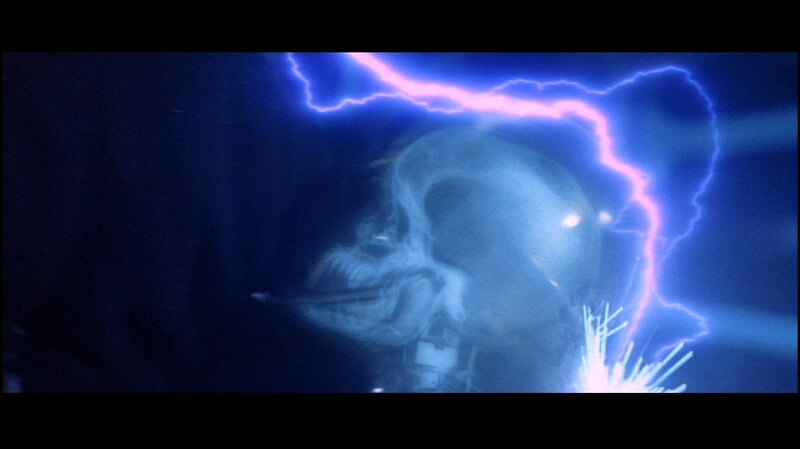 Closeup views [from the ROTJ movie] of Lord Vader's skull and upper neck during Palpatine's lightning counter-assault. Lord Vader totters at the edge of the core shaft, moments after the Emperor's fall. Vader's skull is still visible due to the lingering lightning. Further images showing bone glow in Lord Vader's right arm as he stumbles at the edge of the throne room air shaft. During the duel with his son at Cloud City [in The Empire Strikes Back ], Vader suffered a glancing hit to the right shoulder. The armour sparked and glowed hotly for a moment but it was essentially unscathed afterwards. Vader growled in pain, gave an indignant curse (perhaps in a Sith language? ), and briefly swatted the hot spot using his left hand. Perhaps some flesh beneath the armour was burnt? He might just as easily felt pain in a cybernetic shoulder, like the induced pain that Luke felt when his bionic hand was tested by 2-1B [ TESB ], and shot by a guard on Jabba's barge [ ROTJ ]. However there is one additional piece of evidence. After the Bespin encounter, Vader practiced dueling with a fencing droid, and he remarked that the shoulder had healed well [in Shadows of the Empire comic]. Since a bionic shoulder cannot heal, Vader's shoulder must still consist of his original flesh. 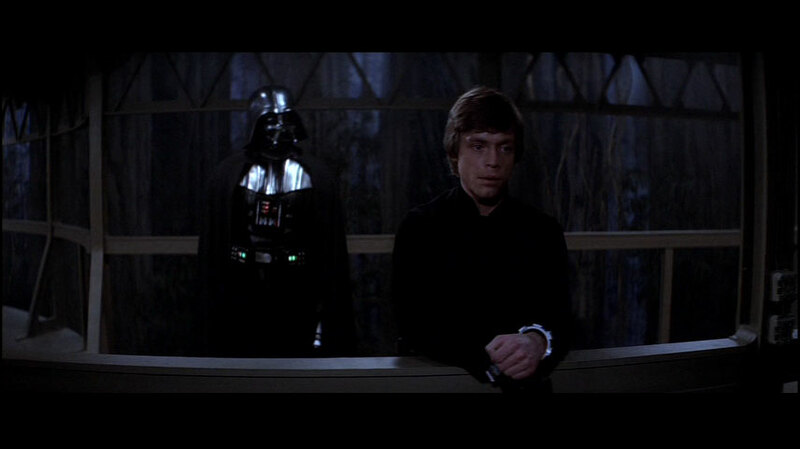 Aboard the Death Star II, Luke Skywalker flew into a rage and cut off his father's right hand. 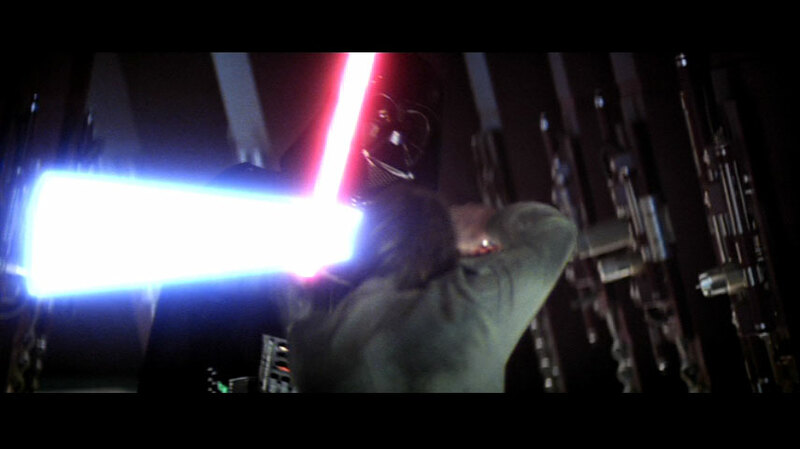 The visible stump proved that Vader's right hand was cybernetic from the wrist downwards. This part was lost to the swordplay of Count Dooku [ AOTC ]. The wrecked wrist hurt Vader initially, but apparently not the continual pain that a man would suffer from the amputation of a natural limb. Vader has lost his right hand, although the shoulder is intact. The final point of amputation must be somewhere between the top of the shoulder and the cut he received on Geonosis (approximately halfway to the elbow). The skeleton observations still allow for separate remnants of his original tissue in the lower left arm and upper right arm, with most of the remainder consisting of cybernetic mechanisms. "I don't imagine that the Emperor was pleased," Luke murmured. "No, he wasn't," Mara said, her voice dark with memories of her own. "Vader nearly died for that blunder." Deliberately, she looked over at Luke's hands. "That was when he lost his right hand, in fact." Jade's claim is not straightforward. Vader had already lost his organic right hand during the Battle of Geonosis [ AOTC ]. Did he lose a cybernetic hand as punishment after the Battle of Yavin? Perhaps Jade was a misinformed non-witness to the punishment? Perhaps her recollections are biased by her jealousy of Vader's position in the Imperial Court or by the tormet she feels since her loss of status? Palpatine did not hold Mara Jade in full confidence: he let her believe that she was unique as "Emperor's Hand", he concealed Vader's identity as a Skywalker. Perhaps her reference to Vader's hand betrays a fixation on her own status as a "Hand." 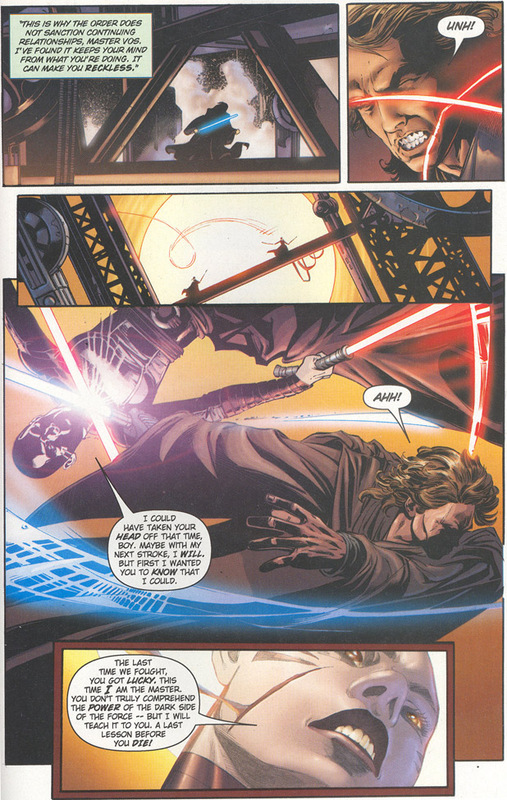 Alternatively, Jade may have spoken metaphorically, and Vader's lost "hand" may have been a favourite instrument or human aide (in the sense of "right-hand man"). As detailed sbove, the skeletal observations strongly suggest that Vader's left arm is substantially or entirely artificial, at least in the vicinity of the shoulder joint. Much of his left arm was severed when he lost his duel on Mustafar, and the Emperor's surgeons apparently didn't reattach it. Evidence regarding the final state of Lord Vader's legs is scarce. On Mustafar the lower parts of his legs were chopped off, but how much of his upper legs remained in later years when he met his son? (He could have had further injuries.) Some men of Vader's age have poor knees, yet Vader has great agility, a powerfully confident stride, and at least the capacity to kneel and stand easily. The good functioning of Vader's legs suggests two opposite explanations: that they are largely cybernetic replacements, or, at the opposite extreme, his legs may be intact and exceptionally fit for a man of his age. This possibility can't be dismissed out of hand, considering Lord Vader's general brawn and demonstrated athleticism. However, in an interview with Bill Moyers in the 25 April 1999 issue of TIME , George Lucas gave an explicit preview of how Lord Vader's condition would change in later films. According to this prediction, Vader's legs and arms are largely artificial. 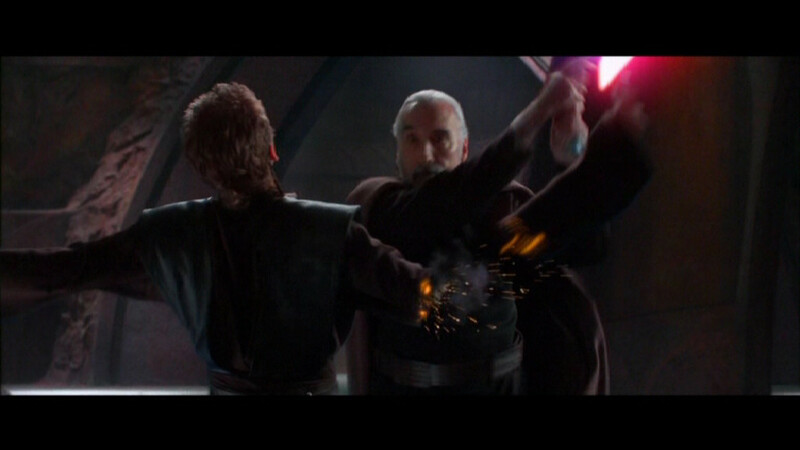 Count Dooku severs the lower part of Anakin Skywalker's right arm, during the Battle of Geonosis [ AOTC ]. 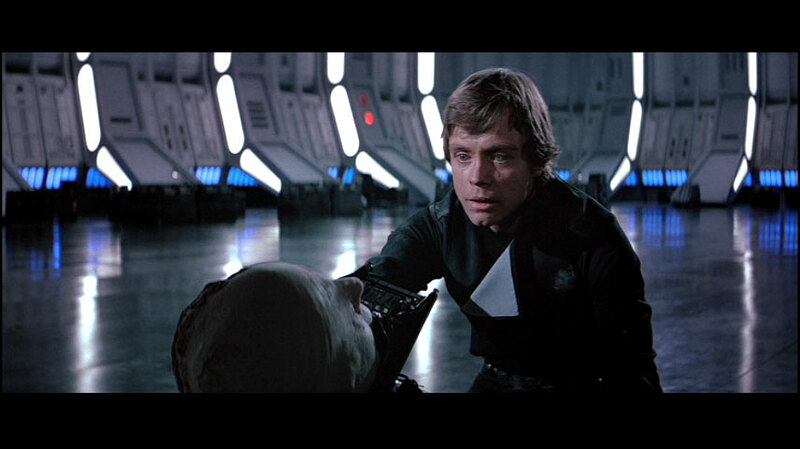 Like his father, Luke Skywalker acquires an artificial hand that is sensitive to pain. Perhaps cyborg limbs are generally made to be damage-sensive. However once the initial damage is registered, both Luke and Vader appear to be free of continuing pain. 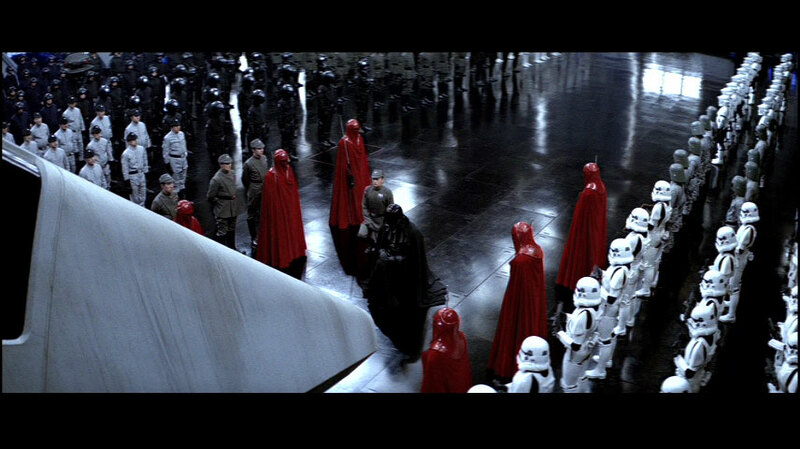 Lord Vader and Moff Jerjerrod kneel as Emperor Palpatine disembarks onto the new Death Star. Lord Vader's most obvious medical problem is that he cannot breathe without mechanical assistance. His unique breath-mask equipment enables him to survive regular human activities in a standard atmosphere. Vader's breathing is “machine-regulated” [ Return of the Jedi novel]. Nevertheless involuntary emotional reactions could override the pace of this mechanical breather [ Shadows of the Empire novel]. Later in Return of the Jedi his pace of breathing quickens during physical exertion. These observations imply that his original lungs and vital organs are present, but require assistance. The mask may not be entirely or directly responsible for oxygenating his blood. Further evidence that Vader is able to consciously moderate his breather occurs during his confrontation with Luke Skywalker at Cloud City. After falling into the air-shaft and reentering the carbonite freezing facilities, Luke was surprised by Vader in a dark passage. Vader's ambush was only possible because he could temporarily still his loud breathing. At the same time, the breather seems to have an automatic mode which can be more thoroughly independent of Vader's will or mind than the unconscious breathing reflex of a healthy human. This mode is most peculiarly manifest on occasions when Vader speaks and breathes at the same time, such as when he first met Moff Jerjerrod aboard the Death Star II. There were moments when the breather inhaled or exhaled at the same time as Vader was pronouncing his syllables. As mentioned above, Lord Vader has suffered a serious spinal injury near the base of his skull. This would sever the connection between brain and lungs, preventing the normal breathing reflex. For Vader to stay alive, his muscles responsible for breathing must be artificially controlled or else wholly replaced by machinery. Since Vader would be a quadriplegic without replacement of his broken spinal cord, he obviously requires some kind of nerve replacement and cybernetic control. 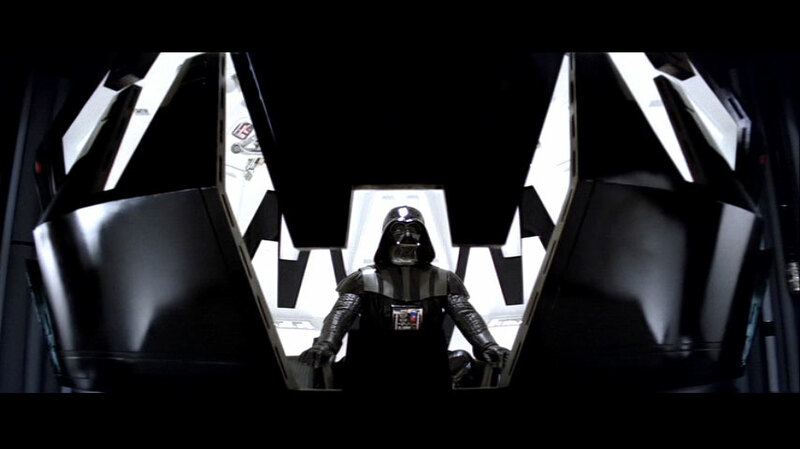 Vader could only rest when he retreated to a special hyperbaric meditation chamber. This pressurised life-support environment allowed him to exist unmasked in some comfort. One such chamber was built into Vader's quarters aboard the Executor [ TESB ]. The novelisation [p.83] indicates that a small, retractable respirator tube enabled him to survive for a short time with the pod momentarily open. A similar facility existed in Vader's main fortress in Imperial City [ Shadows of the Empire ]. He must have had others aboard other flagships, on both Death Stars, in his castle on the planet Vjun [ Dark Empire II ] and other Imperial facilities where he resided. The surgical theatre where he was revived as a cyborg [ ROTS ] must have had the same pressurised gas mix (until his mask was sealed). Once sealed, Lord Vader's mask and armoured suit can serve as an airtight spacesuit for at least a short time. He apparently relied on an internal oxygen supply when crossing from star destroyer Devastator to Princess Leia's blockade runner, and when he flew his TIE fighter in the Battle of Yavin [ ANH ]. He has survived surprise exposure to space in an assassination attempt by mutinous Imperial officers [ Marvel STAR WARS #52 ]. Was the physically oppressive nature of Vader's breathing difficulties great enough to affect his disposition or add to his aggression? Perhaps it is significant that he used telekinetic strangulation more often then any other method of intimidating or killing those who frustrated him. Shadows of the Empire provides details about Vader's infirmity and his effort to cope with it. His original lungs remained, although the passages were crumpled and the alveoli (the microscopic cusps in the lung lining where oxygen enters the blood) were damaged. Perhaps the tissue was burnt by the hot and poisonous fumes from the lava rivers of Mustafar. Oddly, the sound of Lord Vader's breathing aparatus changed, becoming more strained and wheezy, very soon after he lost his artificial right hand during the Battle of Endor. Why should maiming affect the breather? 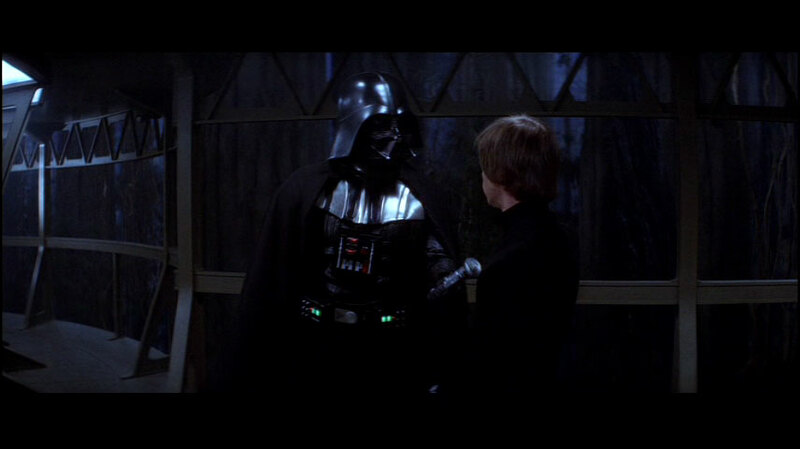 Was some other component of Vader's suit damaged when Luke hounded his father onto the bridge? Was this merely an effect of temporary exertion? 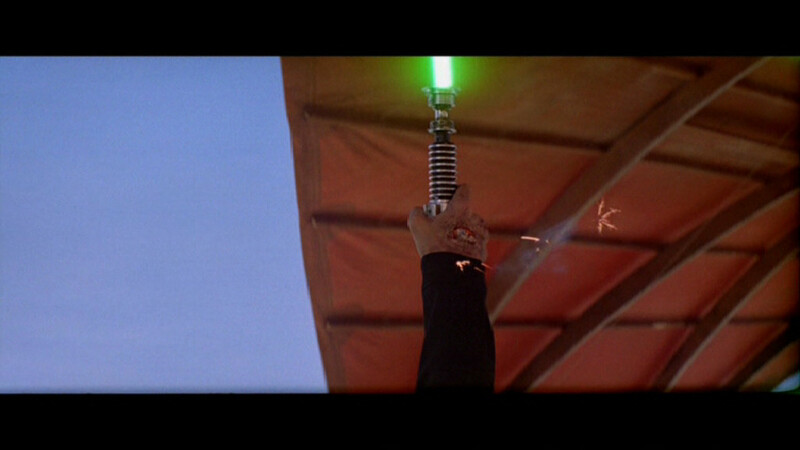 This malfunction did not occur when Vader exerted himself on Bespin (a year earlier). 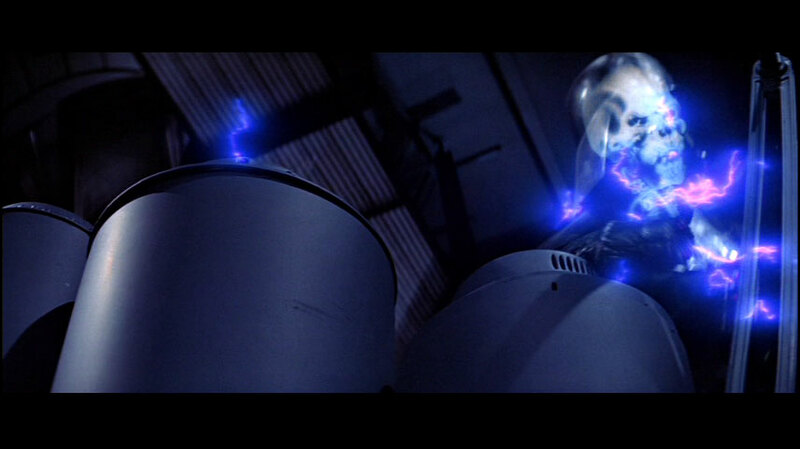 Lord Vader's breather was seriously damaged by lightning during his struggle with the Emperor. Although it continued to operate to some extent, the sound of the mechanism was reduced to a strained rasp. Did the dying lord need to exert conscious effort to keep the damaged mechanism partially functional? The laboured breathing sound persisted until his final unmasking. 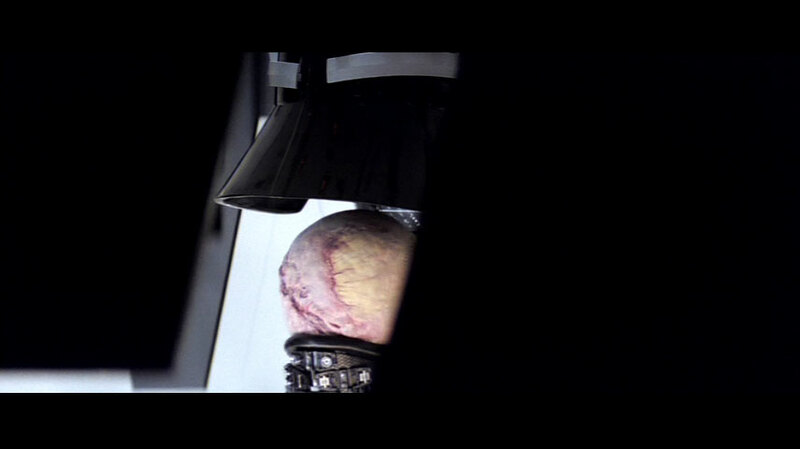 In The Empire Strikes Back audiences and Admiral Piett gained a glimpse of the back of Vader's head in the moments between the opening of his life-sustaining meditation pod and the completion of Vader's automatic re-masking. At the end of Return of the Jedi Vader was unmasked for the last time: without the aid of his specialised life-support equipment. After uttering a few words to his son, he lost consciousness and perished. Note the very large scar which runs from the top of his head down to the base of his neck, and the similar scar which stretches from his left cheek around past his left ear. This suggests that Vader sustained very serious lacerations or burns to the head at some time in the past. It is not clear whether this scarring must be due to the same event as whatever damaged his breathing ability. When the opportunity arises, I shall seek further medical opinion about whether there is damage to the skull (in the above illustrations) which might correlate with the scars. At the moment I cannot conclude whether the scars are superficial or whether they could indicate places where Vader's head was once actually crushed or smashed open. Alternatively, some of the markings may be operation scars left by the medical efforts that preserved his life, possibly connected with the skull deformation. Note that Vader no longer has eyebrows. Whatever injury (or deliberate depilation) made him bald on the top of his head has also affected his brow, very close to his face. Yet his eyes are apparently intact and functional. Aboard the Death Star II, the Dark Lord's eyes appear blue and as healthy as they were before his fall; he isn't even bloodshot. He has eyelashes. He gazes directly at Luke, with focus, and he blinks like an ordinary man. In public, Lord Vader always covers his eyes with the dark lenses of this mask. 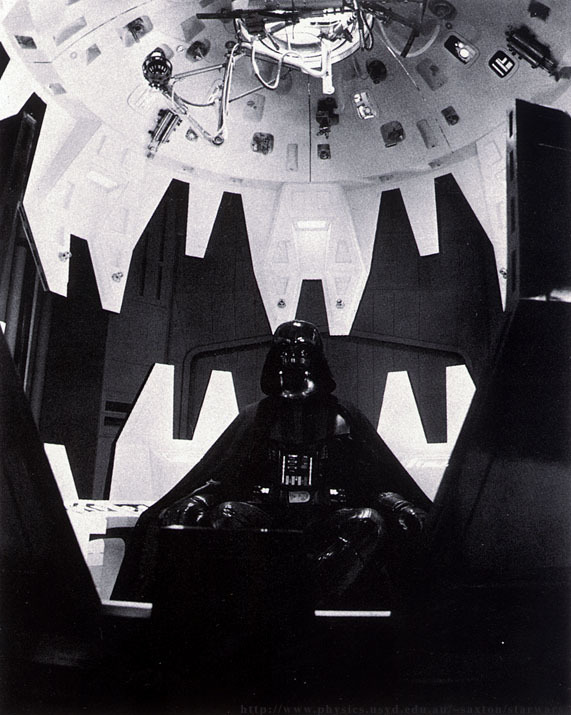 Vader's use of a hyperbaric meditation pod suggests that he needs a completely enclosed mask to maintain a high-pressure environment, although temperature control and protection from potential infection may also be important if his body's natural immune system and/or thermostasis are weak. These reasons would require enclosure of his eyes, but the use of dark eye covering, rather than a transparent mask, may be chosen for the sake of concealment or morbid decoration. or it may serve a more practical function as well. Alternatively, the dark covering may be practical too: perhaps the mask is designed to compensate for a visual handicap or to protect a sensitivity against normal light levels. The Return of the Jedi novel refers to visual enhancement devices within the mask, meaning the sights that Vader sees are actually on an internal viewscreen. The mask lenses may be nothing more than photoreceptors, without actually being transparent. 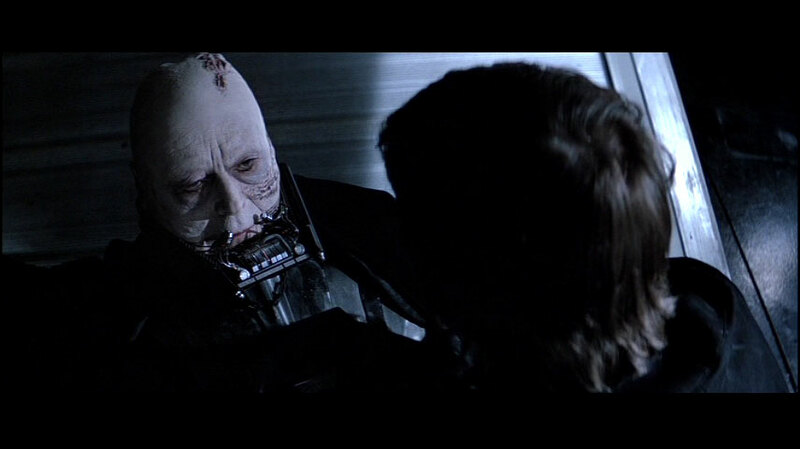 The visual equipment of Lord Vader's mask cannot be completely opaque, however, because at several moments in A New Hope , his eyes can be dimly seen through the mask when it is illuminated in a particular way. Further front and back views of Lord Vader's bare head at the time of his death. Anakin Skywalker gains a facial scar, a vertical line over his right eye, in a duel with Count Dooku's protege, Asajj Ventress. [ Republic #71 ]. This scar was no longer apparent by the time Lord Vader died. Flashed images of Lord Vader's skeleton in Return of the Jedi hint that he still possessed teeth, although it is possible that they're bent inwardly somewhat. Shadows of the Empire explicitly reveals his teeth, which he gnashes in anger at one point when he is being humiliated by the Emperor in the presence of his rival, Prince Xizor. In the same instance Vader has thoughts about biting off his tongue and swallowing it. This implies that he is still capable of chewing and consuming food in the ordinary fashion. Although he sat at a banquet table in Cloud City in The Empire Strikes back and he held a drink on one occasion in the Death Star conference room in the novelisation of A New Hope it is unknown whether he has any mechanism which will allow him to eat while masked. It seems most likely that he only takes nourishment while unmasked in the privacy and safety of his medical chamber. We can assume that his chambers also provide facilities to deal with the other end of his alimentary process. 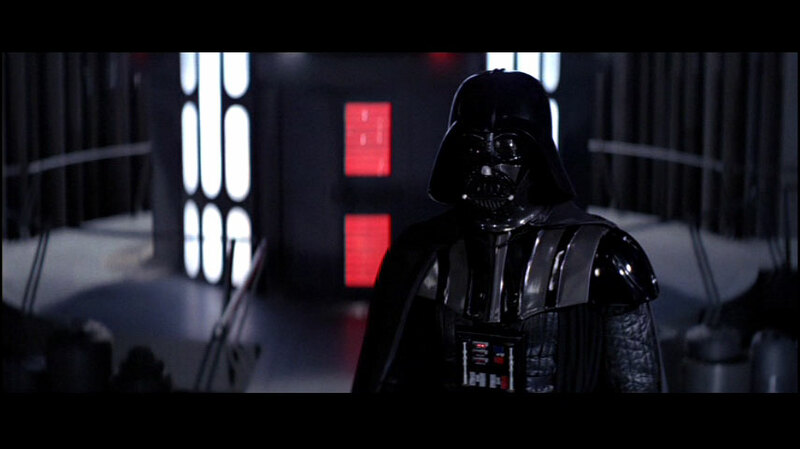 Vader was able to speak even when unmasked shortly before the destruction of the second Death Star. The weakness of his voice was probably partly due to his breathing difficulty and the internal mortal wounds and damage to his cybernetic systems inflicted by the Emperor. Vader's voice might have been weak even under normal circumstances, due to his permanent breathing difficulties. His voice (and incidentally the sound of his breathing) ordinarily was amplified by a microphone in the breath-mask. The exact cause of Vader's death is a matter of confusion and dispute in some circles. Understanding his demise is almost the crux of understanding his overall injuries and persistent infirmities, so this sub-topic deserves special attention. He needed his mask to breathe effectively, and he would eventually die without it. Luke stated as much, and Shadows of the Empire showed that he could not survive open air without intense meditation, in an uninjured condition, and never for more than a few minutes. For a healthy human, falling unconscious due to oxygen starvation takes more than a minute, but Vader was not a healthy human. The functional area of his lungs may have been reduced, and the mask may have had a direct role in oxygenating his blood. Perhaps his mask's internal environment had a high air pressure and/or an unusual gas mix, as implied by the naming of his hyperbaric medical chamber. If this is the case, then sudden exposure may have hastened his death. It is clear that the loss of his cybernetic right hand was not a mortal injury. The hand was completely artificial and he could not lose blood or any other vital substance through it. 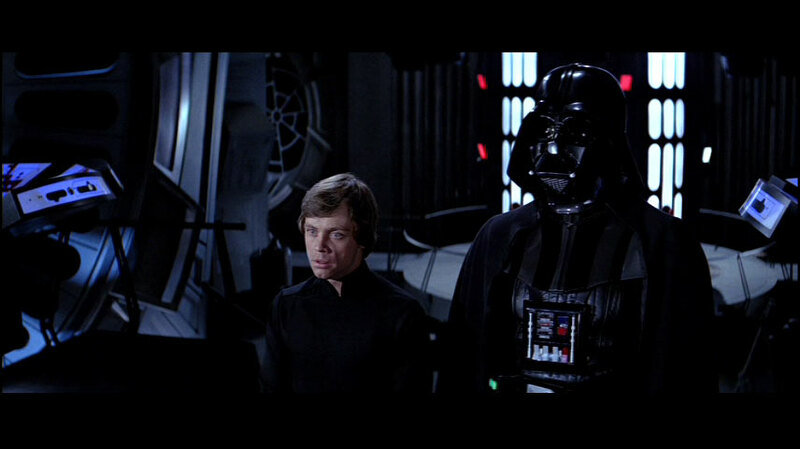 Once the threat from Luke's lightsabre was removed, Lord Vader was able to rise to his feet and stand in reasonable comfort beside the Emperor. Loss of the hand was merely an inconvenience. Vader's mortal injury was inflicted by the Emperor's lightning. 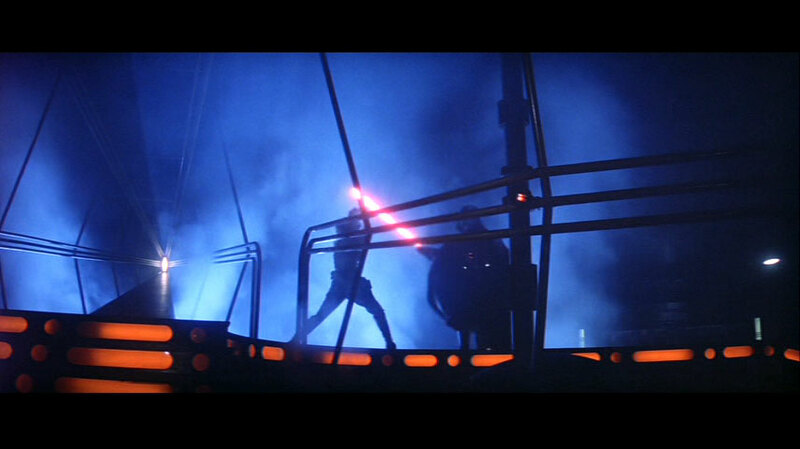 The lightning which lashed Vader was of a lethal intensity. The energies which Palpatine had previously used to strike Luke were less powerful, intended merely to cause agony and torment. When Vader seized him, Palpatine was already intensifying his output, with the intention of finishing Luke. These discharges were absorbed by Vader rather than his son. 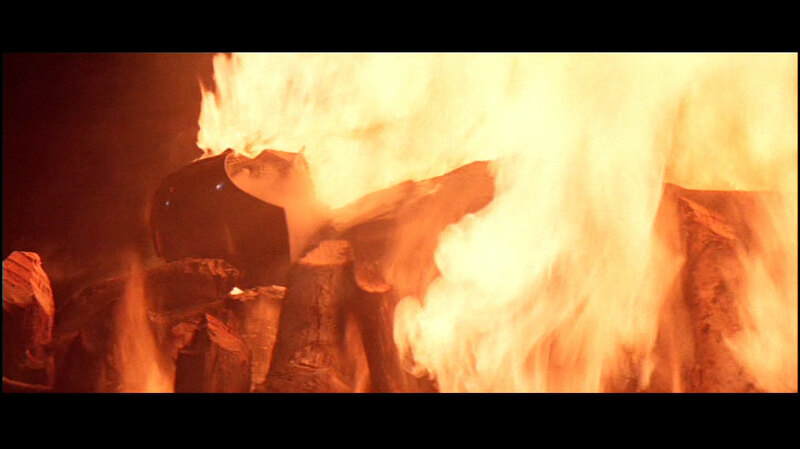 The remarkable intensity of these final energetic bursts (exceeding the shocks that had tormented Luke) is evident in the way they heated Vader's bones enough for to glow visibly through his flesh and clothing. The outbursts were brief enough not to roast him totally, but the instantaneous peak power is remarkable. Luke's skeleton never reached this incandescence, even for an instant. 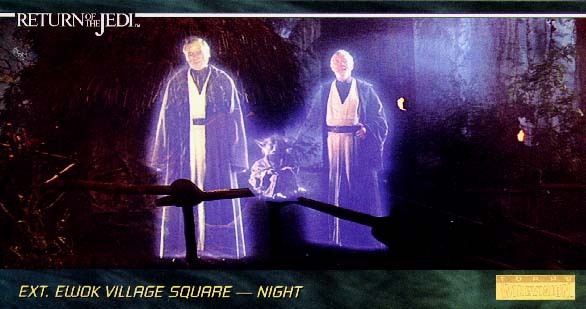 In The Truce at Bakura , Luke Skywalker suffered lingering effects from the milder Force lightning he had experienced. His medical droid identified some bone damage, and prescribed rest and recuperation. The nature of the damage isn't made clear, but it was specific to the bones. It seems possible that the effect of Palpatine's lighting on Vader's bones was similar but orders of magnitude greater in severity. 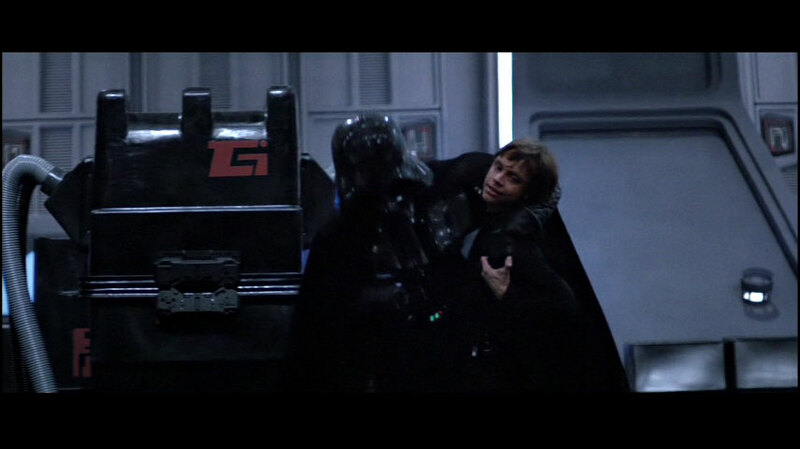 Vader did not die instantly, although he became an immobile deadweight who depended on his son's support. The cyborg connection replacing his damaged neck vertebra ceased operation, sending him into the paralysis which accompanied his old spinal injury. By the sound of it, his mask's breather was broken. His armour was scorched and his electrical life support systems were probably ruined. The point of controversy is whether the lethality of the Emperor's final lightning bolts or the ruination of Vader's cybernetics was most important in dooming him. We know that the energy which Vader absorbed was lethal in its own right. On the other hand, a lesser amount of electrical damage might have ruined the life-support irreparably. There isn't any obvious way to resolve this issue. 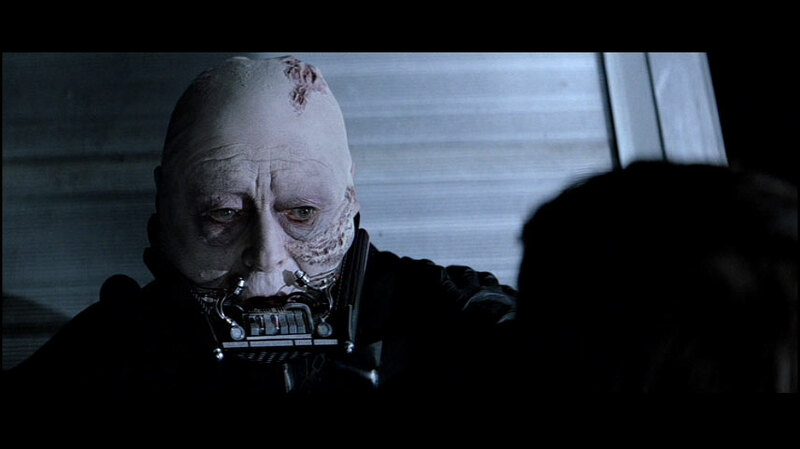 In the absence of better information I conclude that both factors undoubtedly contributed to Lord Darth Vader's death, but the immediate cause was the removal of his breather mask. Anakin Skywalker passed out of consciousness and out of life due to respiratory failure. NOTE: This web page does not and will not consider supernatural, mystical or teleological "explanations" of Lord Vader's living condition and ultimate demise. It is pointless to speculate about whether his death was somehow deemed "necessary" by the Force or some other entity. Claims about a supernatural connection between the continuance of Vader's life, the Emperor's power and Luke's knighthood etc will always be both unprovable and unfalsifiable. Those intangibles are a matter of poetic interpretation; they depend on private, individual, subjective perspectives. On the other hand physical effects of lightning (whatever its origin), Vader's disabilities, deformities and the process of death are tangible. These objective realities are amenable to fruitful and conclusive discussion. That is the purpose of this commentary. Prior to the filming of Episode II there was enormous popular discussion about the representation of Anakin Skywalker as a healthy adult prior to his fall. The identification of potential actors was a matter of intense speculation, and the panic and excitement in some fan communities could be described as hysterical. The situation was exacerbated by provocative statements attributed to controversial (and short) contenders, and by the innately self-referential interaction between sensationalist media reporting and Internet-based fan rumours. Therefore it is beneficial to review the objective evidence concerning Anakin's adult but uninjured condition. Anakin Skywalker had the torso of an exceptionally tall man. When he was penetrated by lightning in ROTJ we saw that his torso is essentially original and sized in proportion to his armour. As Darth Vader he was riddled with prosthetics, but his body was in excellent proportion. His limbs were not out of scale with his head and torso. 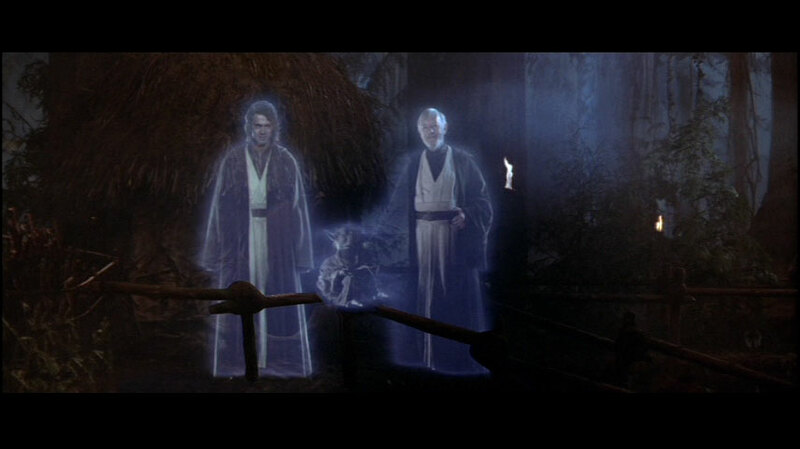 When Anakin reappeared in spirit form in ROTJ he towered over Obi-Wan Kenobi. His spirit manifestation was free of cybernetics and presumably reflects the natural or potential condition that his body should have been in, as a man aged in his forties. 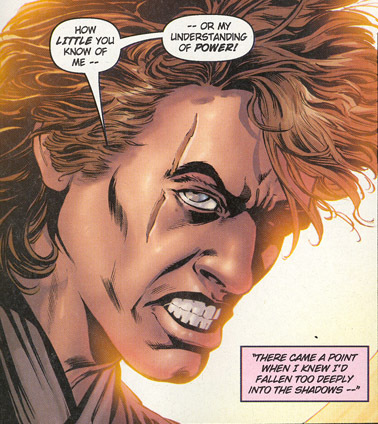 The ROTJ novel describes the pre-fall Anakin as "striking, and grand, with a wry tilt to his brow that hinted of invincibility and took in all life with a wink." 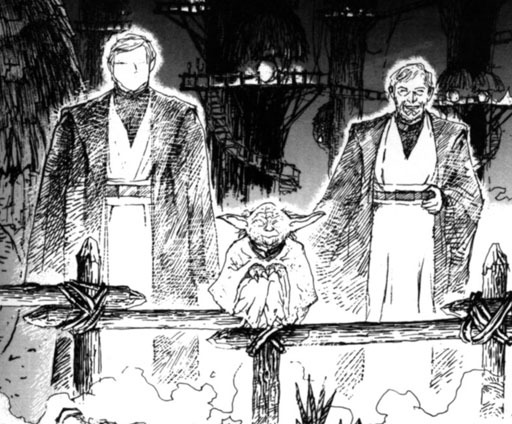 The representation of the adult Anakin Skywalker as a tall man is affirmed throughout many fields of licensed products: the action figure of his spirit form; the Japanese and English comic versions of TESB and ROTJ ; his apparition in The Truce at Bakura novel. Neither was physically imposing, though one had a build suggestive of considerable future development. .... [Bariss Offee found] herself facing an attractive young man who wore confidence like a handmade suit. Anakin Skywalker, as an unharmed adult and by his natural genetic potential, was destined to be an exceptionally tall man, over 2m tall. He needn't have been unusually muscular at any particular age. His apparent muscularity as Lord Vader might be the result of exercise and conditioning occurring after his downfall. 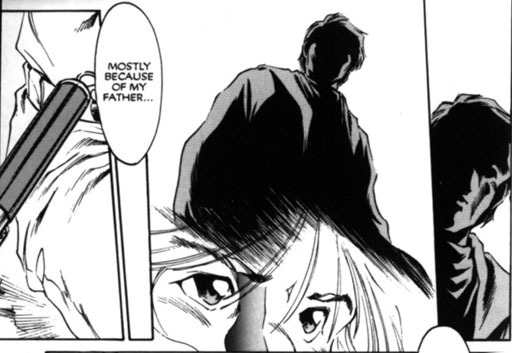 The Manga versions of TESB and ROTJ include images of Anakin Skywalker as an intact, mature adult. He is shown to be a man of heroic, towering stature. This must represent a conscious and recent editorial decision by the licensing authorities of Lucasfilm. Lord Vader's duel with his son on Bespin. They begin in a Cloud City carbonite freezing facility, where they are seen in dramatic silhouette. 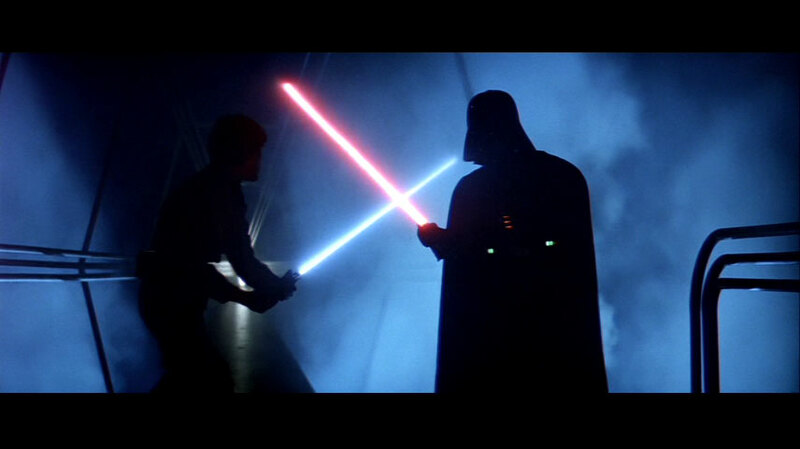 The fight resumes as towering Vader lunges from the shadows, hurling his ferocity at his weary son. Luke retreats before this herculean frenzy. 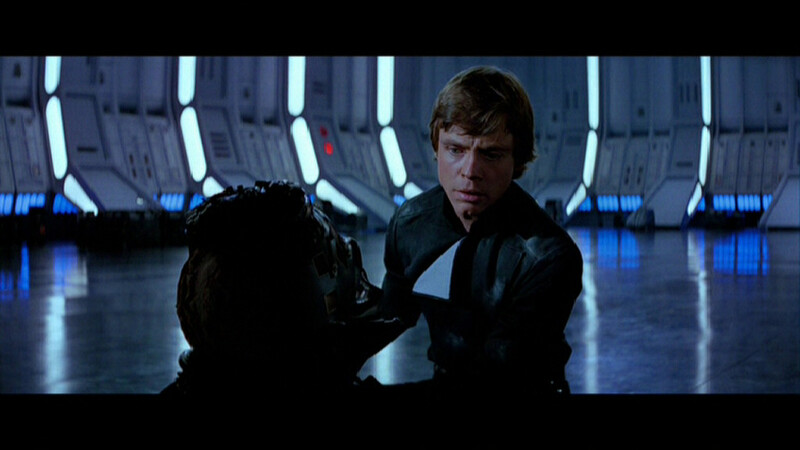 The duel ends when Luke loses both his hand and weapon. 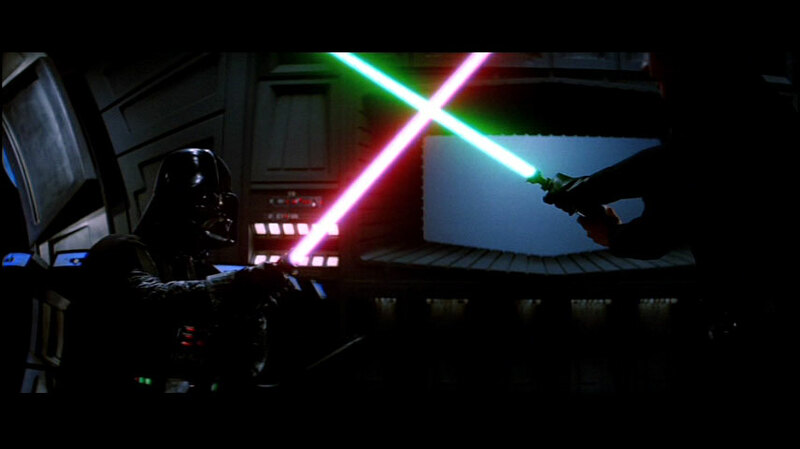 Vader emplores Luke to join him to confront the Emperor and restore order to the galaxy. Walking with the Emperor past thousands of troops and crewmen, Lord Vader glanced warily at his master when Palpatine observed that Vader's thoughts were concerned with finding his son. Perhaps Vader is hoping that his master does not also sense his treasonous ambition of leading young Luke in the overthrow of the Emperor. On the forest moon of Endor, Lord Vader's son surrendered himself to the crew of an AT-AT walker. 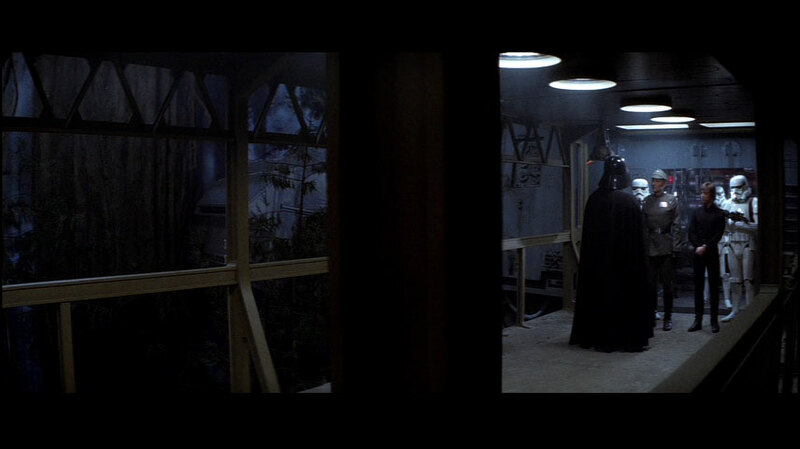 During peaceful minutes before the Endor dawn Vader has a long-awaited encounter with his child. After the conversation ends in disagreement, the Dark Lord seems unsettled and introspective. Luke and Anakin Skywalker face the Emperor as captive and captor. 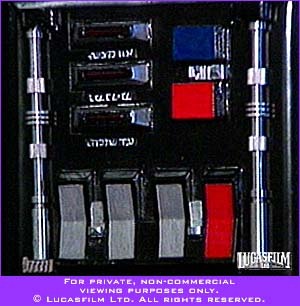 An image of Lord Vader's life systems control chestplate, which unfortunately is not sharp enough for the lettering to be discerned. 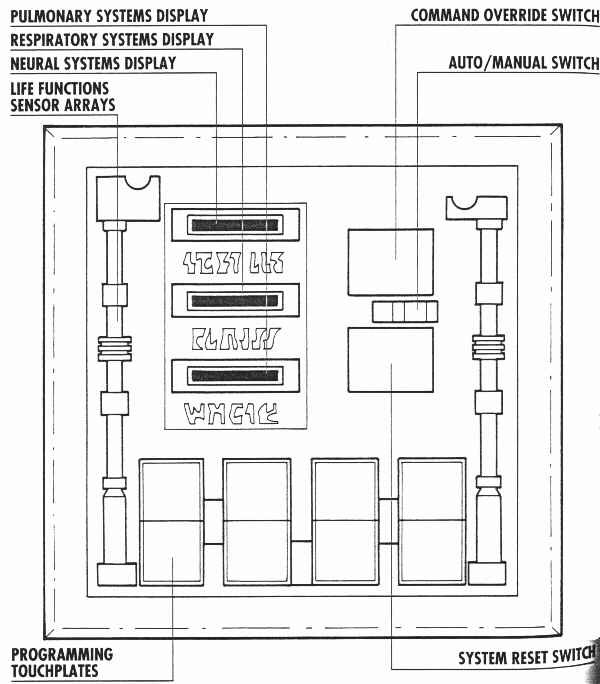 Second is a drawing of the chestplate indicating meanings for some indicators and switches, according to STAR WARS Technical Journal . In the Emperor's throne room aboard the second Death Star, Palpatine goaded Luke Skywalker into a lightsabre duel with his father. The Emperor and Vader both hoped that the boy would be consumed by despair and aggression and thereby embrace the Dark Side of the Force. 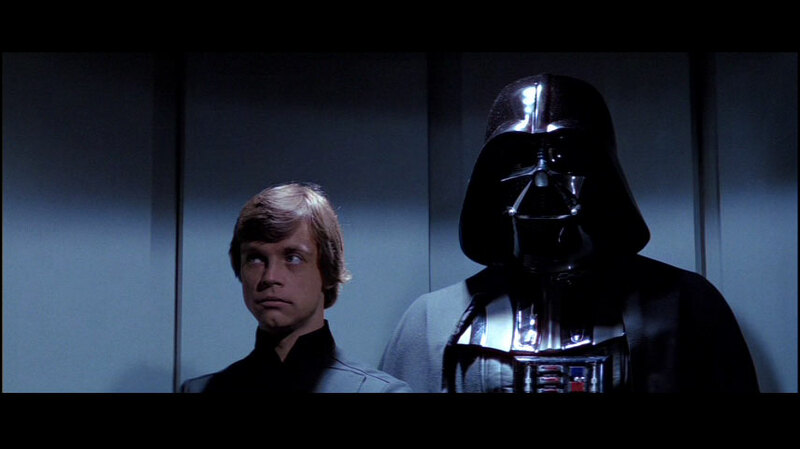 The Emperor was willing to expend Vader's life to acquire and dominate a young and malleable apprentice. Vader's motives were more paternal: to reclaim his son and to ally with the boy to fulfill his secret ambition of ending Palpatine's tyrannical reign. 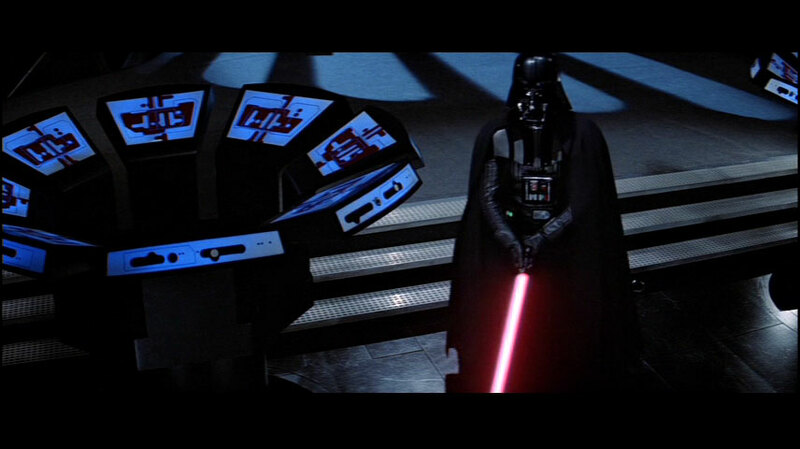 Although the son would not be turned, Vader was ultimately victorious in a sense that he did not anticipate. 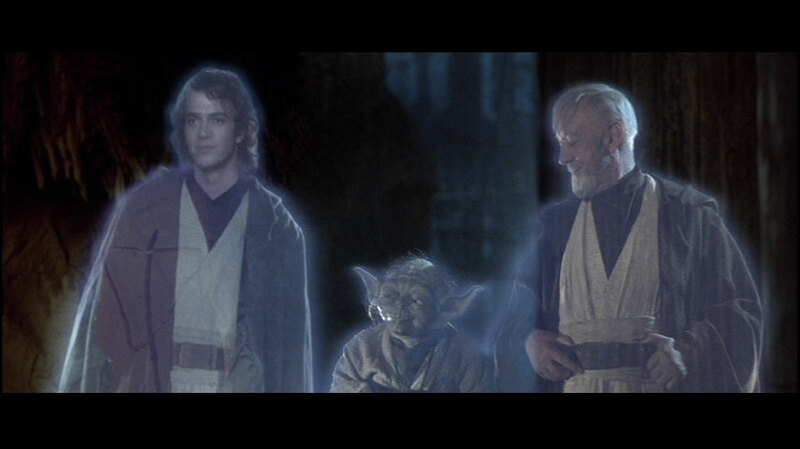 He was rejoined with Luke and slew Palpatine. After hurling Emperor Palpatine to death, Lord Vader leans at he edge of the throne room airshaft as the despot's lightning barrage seethe for a moment longer. The Emperor's lethal lightning defense against Vader's attack left the Dark Lord weary and seemingly paralysed. Most of his cybernetic systems and life support systems were ruined or failing. As the two Jedi made their escape from the exploding battle station, Luke was forced to carry his father's hulking but enfeebled form. 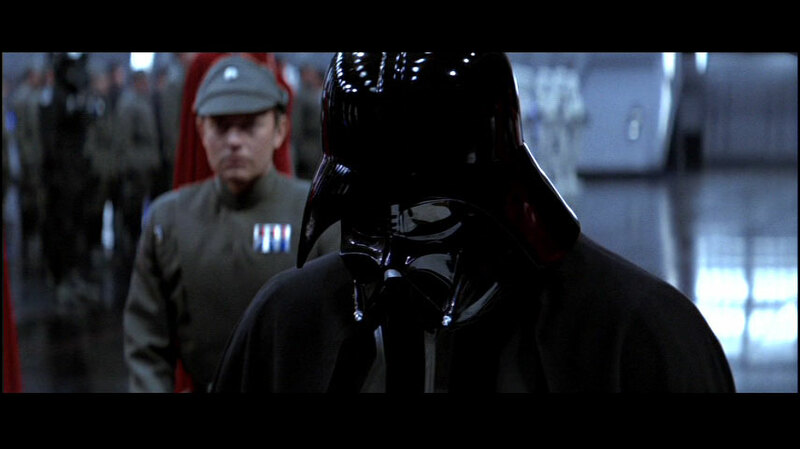 Removal of Vader's outer helmet revealed the complex mechanisms at the crown of the mask. 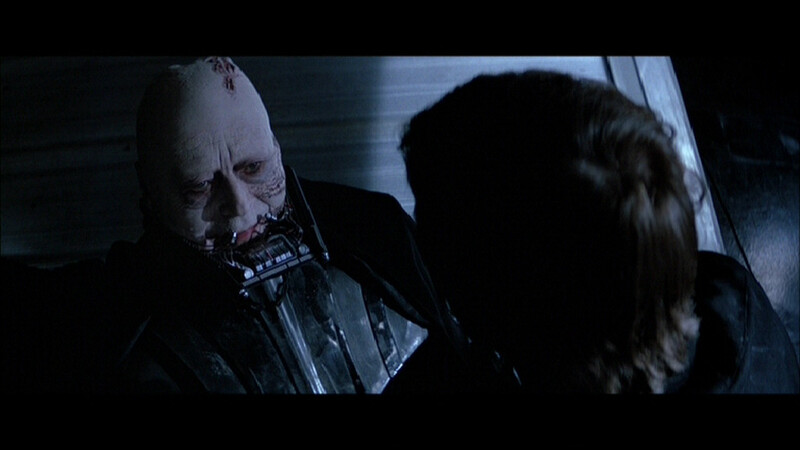 Without the support of his breather apparatus, Lord Vader died of lack of oxygen within less than a minute. Topps Widevision card depicting Lord Vader's unmasking. 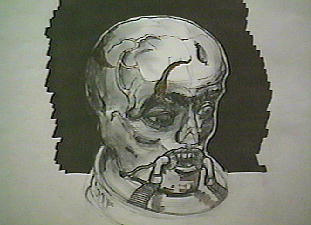 A design sketch for Lord Vader's unmasked head. Lord Vader's armour, alight on his funeral pyre on the Endor sanctuary moon. According to the ROTJ Radio Drama , C-3PO is just off-camera at this moment and he approaches to offer sympathy to Luke. In this scene, Threepio knows Vader's secret identity. Chris Barnaby for suggestions regarding the interpretation of Mara Jade, the cosmetic normality of Vader's face, and the attraction of lighting to his artificial vertebrae. Adam Casey for reminding me about Lord Vader's knees. Greg Chapman for suggesting the possibility of operation scars. 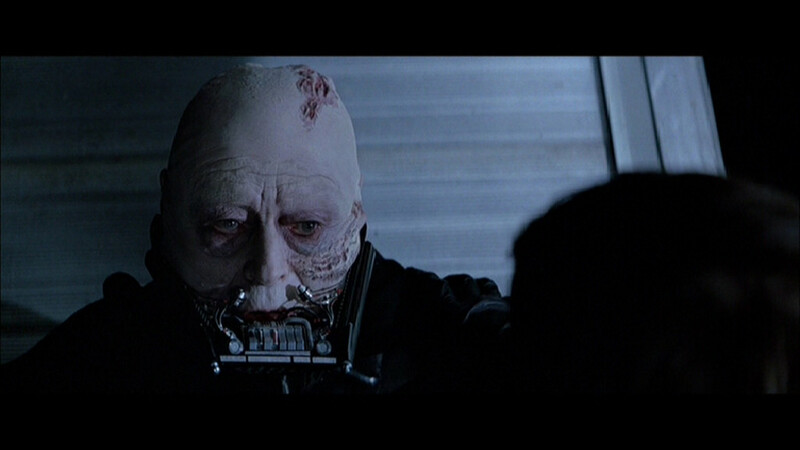 Ellynne Grant for suggestions regarding the condition of Lord Vader's eyes, and for the reference to the respirator tube in TESB . Jess for the chestplate image from STAR WARS Technical Journal . Barbara Johansen for important observations relating spinal damage to Vader's breathing disability, and for the provision of exceptionally clear images illustrating the damage. Caleb Lawson for one small qualification regarding the "inevitability" of Vader's death. Tony Liang for a refinement of observations regarding involuntary changes to the pace of breathing. Maria from Cuenca, Spain for demonstrating that there are instants in Return of the Jedi when bones and cybernetic mechanisms within Lord Vader's right arm are illuminated. I had previously failed to notice anything in his arm. Aaron Marra for pointing out that the spinal injuries might have happened on Mimban. Jussi Myllyluoma for comments about the timing of oxygen starvation, and emphasis on the power of bones seen glowing through flesh. 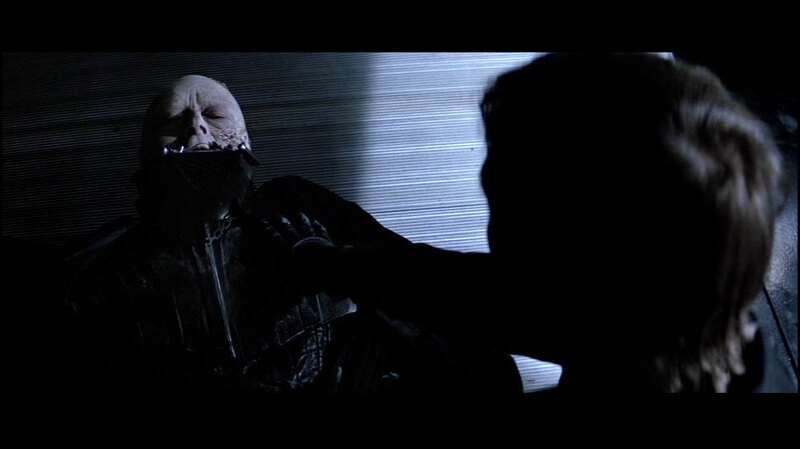 Tod Nelson drew attention to Vader's experience of pain from his cybernetic hand. Stephanie Osowiecki for reminding me about Splinter of the Mind's Eye . Wayne Poe for the Starlog #40 quote, and discussion relating these points to Vader's paralysis; highlighting the strange wheeze following Vader's maiming in ROTJ ; general proofreading. Nick Pitchford for mention of the curvature of teeth. Adrijana Radoshevich for observations regarding Vader's voluntary and automatic breath control, and his expression of aggression. Tyler Saxton for the use of his video digitisation equipment, the provision of which required him to travel from Melbourne to Sydney and back again; and for arranging the purchase and delivery of my copy of STAR WARS Chronicles . Matthew Springer for pointing out the implications of AOTC for Mara Jade's story about post- ANH limb loss. Andrew Street for drawing attention to Luke Skywalker's bone damage as an effect of Force lightning, as chronicled in The Truce at Bakura . Donald Sword for his examination of the "X-ray" images of Lord Vader. Jeff Thieret for noticing some outdated to images with Vader's former eyebrows. Jeremy Wildrick-Cole pointed out some implications of the fact that Vader's eyes are visible at several instants in A New Hope . 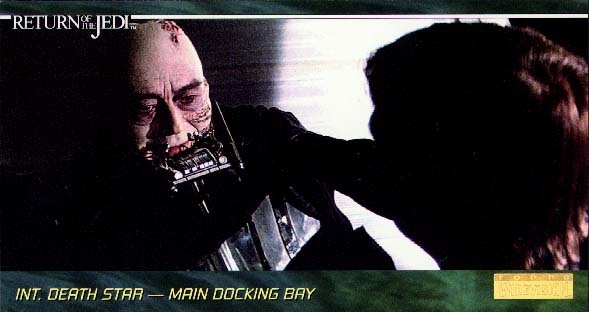 Brian Young for diagnosing and assessing Lord Vader's spinal injury, in his capacity as a physical therapist. Dark Force Rising , Timothy Zahn, Bantam, 1992. Of Myth and Men , Bill Moyers, TIME , 25 April 1999. Makeup Artist #55, Michael Malloy, pp.48-60, June/July 2005. Physical Rehabilitation: Assessment and Treatment , third edition, Susan O'Sullivan & Thomas Schmitz. Republic #71: Dreadnaughts of Rendili (part 3), John Ostrander, Jan Duursema et al., Dark Horse Comics, 2004. Shadows of the Empire , Steve Perry, Bantam Books. Shadows of the Empire , John Wagner, Kilian Plunkett & P. Craig Russell, Dark Horse Comics. Shadows of the Empire Sourcebook , , West End Games. STAR WARS II: Attack of the Clones , George Lucas et al., Lucasfilm Ltd, 2002. STAR WARS III: Revenge of the Sith , George Lucas et al., Lucasfilm, 2005. STAR WARS III: Revenge of the Sith , graphic novel, Miles Lane & Doug Wheatley, Titan Books, 2005. STAR WARS IV: A New Hope , George Lucas et al., Lucasfilm Ltd, 1977. STAR WARS V: The Empire Strikes Back , George Lucas et al., Lucasfilm Ltd, 1980. STAR WARS V: The Empire Strikes Back - Manga , Toshiki Kudo, Dark Horse Comics. STAR WARS VI: Return of the Jedi , George Lucas et al., Lucasfilm Ltd, 1983. STAR WARS VI: Return of the Jedi - Manga , Shin-Ichi Hiromoto, Dark Horse Comics. STAR WARS: The Annotated Screenplays , Laurent Bouzereau, Del Rey. STAR WARS Chronicles , Adeon Inc, Virgin Books. STAR WARS Technical Jounral of the Imperial Forces , Shane Johnson, Starlog Communications International. Topps Widevision , movie screenshot trading cards, Topps. The Truce at Bakura , Kathy Tyers, Bantam, 1994. Original content is © copyright Dr Curtis Saxton 2005. All images in this page which are copyright Lucasfilm Ltd are used under the Fair Usage terms of copyright law.